A study of the preoperative roentgenograms of the esophagus will give the surgeon a fairly accurate impression of the height of the left diaphragm and the location of the cardia with respect to the ensiform process and rib cage. This will aid him to make the choice between an abdominal and a thoracic approach. I have always preferred the abdominal approach and have used it almost routinely. In most individuals, adequate exposure is easily attained, and the details of the myotomy can be carried out without difficulty. It is certainly less traumatic to the patient. The abdominal incision, usually through the midline, should be of adequate length to permit fairly wide retraction. Two broad flat retractors pulled upward and outward bring into view the left lobe of the liver. By grasping the extreme edge of the lobe with a sponge forceps and exerting careful downward traction, the surgeon brings the suspensory ligament into clear focus and permits him to divide it with a long scissors. He should avoid injury to the transverse phrenic vein which crosses anterior to the ligament. The left lobe is folded on itself, covered with a thick abdominal pad and retracted toward the right by the second assistant with the aid of a deep Deaver retractor. This maneuver brings into view the eosphageal hiatus. A transverse incision is now made in the peritoneum and phrenoesophageal ligament overlying the abdominal esophagus which is now bluntly freed from its areolar attachments (Fig. 18). A piece of Penrose tubing is placed around the esophagus for traction purposes. This helps considerably to bring the lower thoracic esophagus downward into the field of operation. Every bleeding point should be accurately ligated with fine silk. A constant dry field will simplify the myotomy incision. The vagus nerves should be pushed to one side if they appear in the lield. With the aid of a No. 15 sharp blade, a longitudinal incision is made in the musculature of the esophagus starting about 2 inches above the site of constriction and continuing downward past the cardia onto the anterior wall of stomach for a distance of about 1 inch. As the circular fibers are divided the mucosa projects through the incision. Great care is needed in completing the muscle incision in the region of the constriction, the cardia, and stomach wall because of the thinness of the muscle layer. It is easy to make an opening in the mucosa at these sites. Should this occur, a few sutures of fine silk will suffice to repair the opening. To guard against reunion of the muscle fibers, which might be a possible reason for subsequent recurrence, it has been suggested by Ellis of England that a section of muscle on each side of the incision be excised after fashioning muscle flaps. At the completion of the muscle incision, its length should measure between 3 and 4 inches, and the mucosa should be prolapsed between the cut edges. The field should be completely dry (Fig. 18). The final step should consist of an accurate repair of the phrenoesophageal ligament using interrupted sutures of 00 silk. I believe this is an important step in the prevention of postoperative herniation through the hiatus. The abdominal incision is now closed without drainage. If the mucosa has been inadvertently opened, it is good practice to drain the subphrenic area with one cigarette drain. The postoperative care of the patient should offer no difficulties. Sips of fluid are given the next day. The amount is increased rapidly thereafter. Soft food is permitted on the fifth day, with gradual increase until the eleventh or twelfth day when a full diet is ordered. 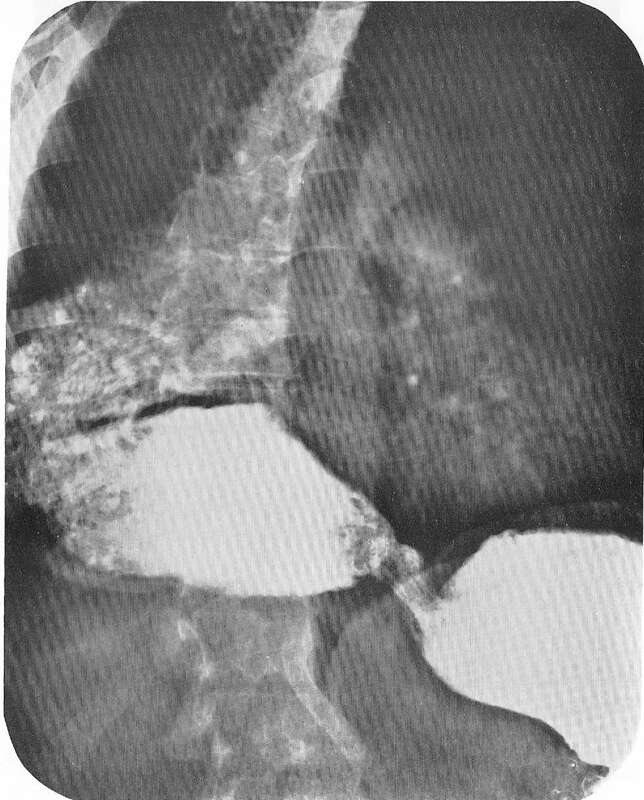 Thorough mastication and the swallowing of small boluses are necessary safeguards during the first three or four weeks (Fig. 19). 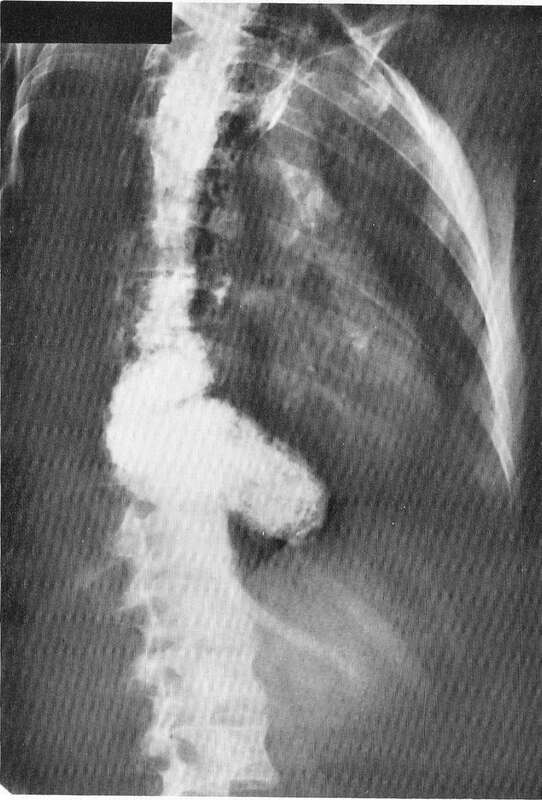 In recent years, attention has been called to the frequent association of pyloro – spasm in many of the patients with achalasia. For this reason, pyloroplasty has been advised as an adjuvant procedure at the time of myotomy. Whether it should be carried out as a routine procedure is debatable. It should not be forgotten as a possible additional step by the surgeon, because it has much to commend it. Fig. 18. Details of the Heller operation showing the upper midline incision in A, division of the phrenoesophageal ligament in B, length of the incision in the esophagus and stomach in C, and protrusion of the mucosa after excision of a wedge of muscularis above the esophagus in D.
care being taken to avoid the cardia and to accurately repair the hiatus. In two instances, the result was satisfactory, but in two others, recurrence was prompt. This operation should never be utilized for stricture secondary to esophagitis because recurrence is the rule rather than the exception. Fig. 19. Postoperative roentgenogram of the effect of the Heller operation, showing a wide open cardia but with little diminution in the size of the esophagus. When reflux esophagitis occurs and produces organic stenosis and/or severe bleeding episodes, the surgeon is faced with a difficult problem. A uniformly successful operative procedure has not as yet been devised for this complication. In the past, I have utilized an operative procedure consisting of removal of the proximal half of the stomach and of the lower third of esophagus, bilateral vagotomy, and complementary pyloroplasty. It is a most difficult operation from the technical standpoint because of the extensive inflammatory reaction in the posterior mediastinum. Half of the patients did well. One patient is now 14 years postoperative and is free of symptoms. The remaining 50 percent eventually developed varying degrees of esophagitis which required rigid medical management. The technical details of this operation are essentially the same as described in the chapter on carcinoma of the cardia. To minimize the possibility of reflux which occurs in about half of the patients subjected to esophagogastrectomy, many surgeons, in recent years, have interposed a loop of bowel (jejunum or colon) between esophagus and stomach. There is no doubt that this procedure lessens considerably the incidence of reflux esophagitis. But even this operation is not completely free of complications. I know of two instances of erosive ulceration in transplanted loops of colon, and in one there was a perforation into the posterior mediastinum. Fig. 20. Roentgenogram of a patient with achalasia of 14 years duration. The lmost complete closure at the cardia is noteworthy. 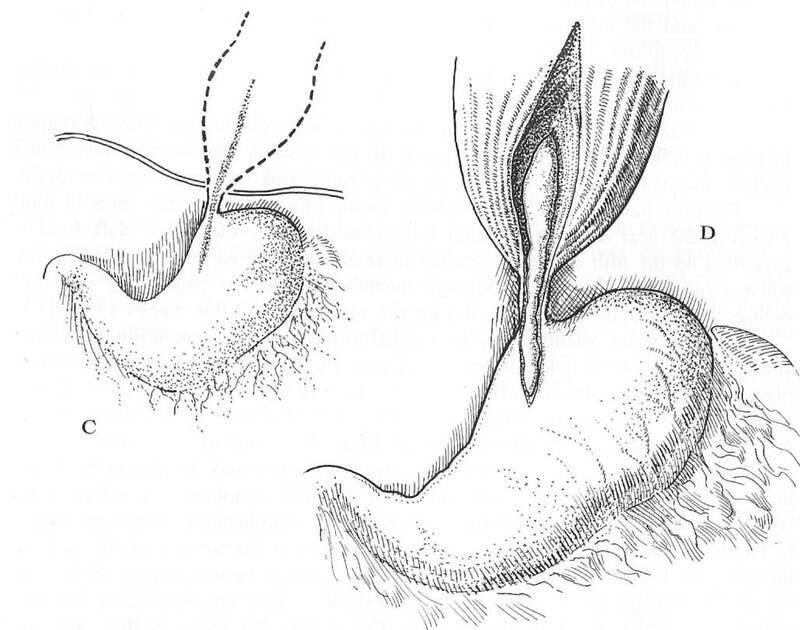 The technique of these procedures will be found in the chapter on hiatus hernia. Because of the generally estimated 20 percent incidence of reflux esophagitis after the Heller operation, surgeons have searched for alternative or adjuvant procedures which would tend to obviate this undesirable complication. Since the most important complication following the Heller operation is reflux of acid gastric juice, it occurred to me that if gastric acidity were greatly reduced or even eliminated, the likelihood of esophagitis would be markedly lessened. This theoretical consideration is in accord with the physiological evidence obtained so far by extensive laboratory and clinical experiments. Accordingly, in three patients presenting an achalasic esophagus with S-shaped deformity, the following operation was carried out. Through an upper midline incision, the Heller myotomy was performed as already described with the additional excision of hyper – trophied muscle on each side of the incision as recommended by Ellis of England. The supplemental procedures of bilateral vagotomy and antrectomy with retrocolic gastrojejunostomy completed the operation. Aside from mild vagal effects (delayed gastric emptying and abdominal distention) which were of short duration and occurred only in the second patient, the immediate convalescence was smooth. The first patient was operated upon 2Vz years ago, the second and third 20 months and 3 months respectively. Dysphagia has been relieved completely, there is neither symptomatic nor roentgenographic evidence of esophagitis, and all are anacid (free acid after histamine) (Figs. 20 and 21). Of course, it is too soon to draw definite conclusions and the group is too small, but the basic physiological reasons for this combined operation seem sound. I believe the problem of the operative approach to achalasia should proceed along these lines. In the absence of definite knowledge of the essential etiology of the disease, it is possible that surgeons will adopt the more radical approach of removal of the diseased esophagus and the interposition of a loop of colon as a substitute organ. However, it should be remembered that these colon loops act only as conduits and are incapable of duplicating the physiological propulsive function of the normal esophagus. Fig. 21. Postoperative roentgenograms demonstrating the wide open cardia. Vagotomy and antrectomy were complementary procedures.